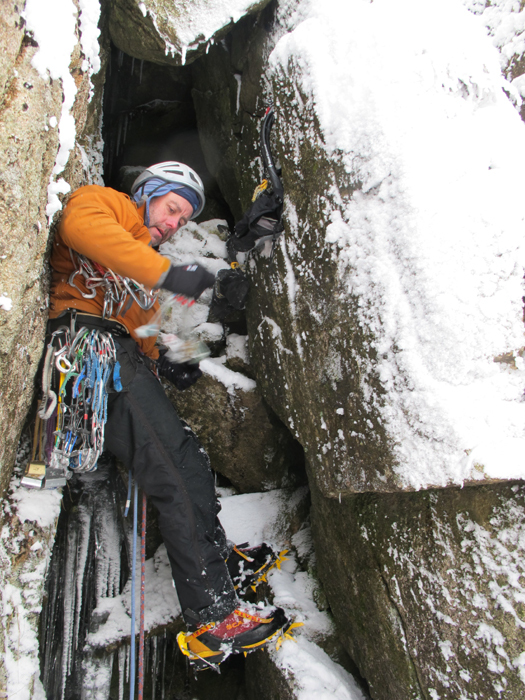 Winter climbing courses at an introductory level. The dates and prices are for 2019, but I will run similar courses in January, February, March 2020. Details to follow. These courses are designed as an introduction to winter climbing, and we'll aim to get climbs of up to grade II or III standard done on each day as well as covering ropework, avalanche assessment, winter abseils and route-finding skills. We'll aim to cover some of the basic skills you'll need to learn climbing safely on snow, pure water ice, and winter "mixed" conditions, although this may depend quite heavily on the weather and conditions we get given!. These courses are suitable for any experienced winter hill-walkers who want to do a bit more. 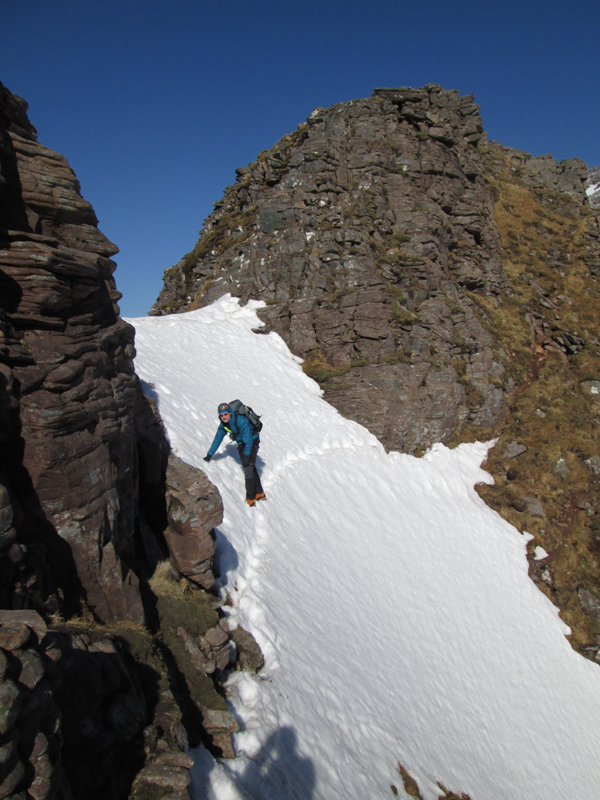 It's a good choice if you are aspiring to do some of the classic Scottish winter ridges such as Beinn Alligin, Liathach and An Teallach. The course is also appropriate for experienced summer rock climbers who want to see what winter climbing is all about. The course will be kept very flexible to adapt to the needs of the clients who book. To some extent we will also have to adapt to the Scottish weather and snow conditions, which can be unpredictable. With the exception of suitable winter boots, we can provide all equipment necessary such as technical ice-axes, harnesses, crampons and helmets. DATES & PRICES ARE LISTED BELOW, OR CLICK ON THE LINK. 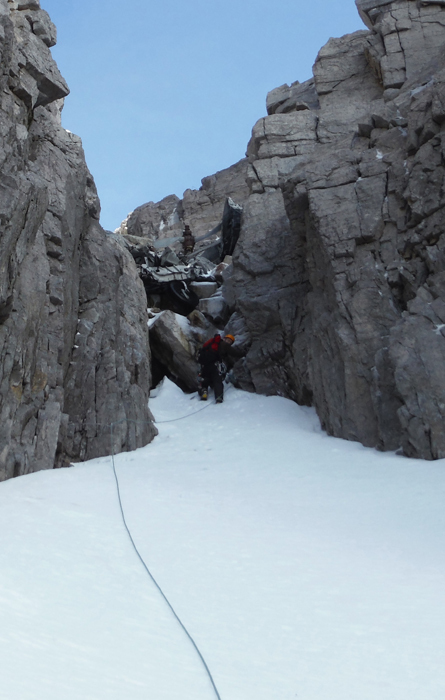 Climbing up to the aircraft wreckage in Fuselage Gully on Beinn Eighe, Torridon, Scotland. 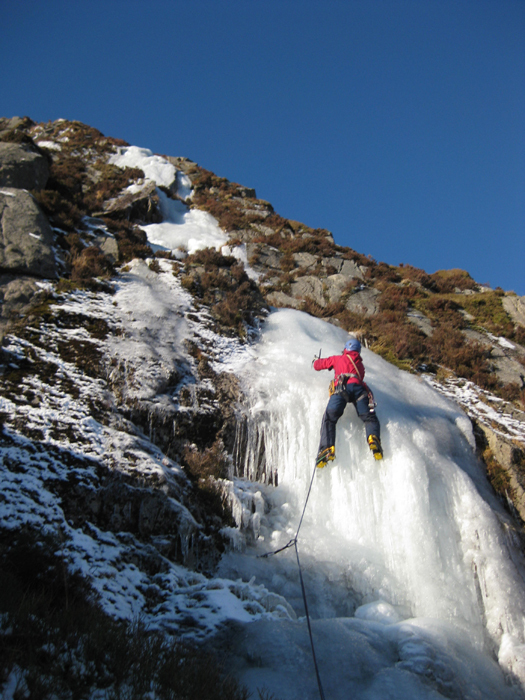 Linda Biggar climbing on pure ice, Cairnsmore of Fleet. Mixed Winter Climbing in Scotland. We use the wee town of Aviemore in the Scottish highlands as a base for these courses. There are various accommodation options in this area, including hostels, B&B and hotels. I can help with arranging accommodation once you have booked a place on one of these courses. Travel to the area is easiest by car from most of Scotland or northern England. From further afield it is possible to arrive by train or to fly into Inverness airport and rent a car (or we may be able to pick you up there). If you want advice on travel and accommodation options before booking please ask! The dates and prices are for 2019, but we will run similar courses in January, February, March 2020. Details to follow. Our price doesn't include your accommodation and travel to the area, but we can help you to arrange these. 2-day course fee - Saturday/Sunday £275 per person. To book a course please print a Booking Form and read the full Booking Conditions. We'll require a completed booking form returned by post or email and a 50% deposit payment per person. Full payment is due two months before the course. We generally need a minimum of two bookings to run these courses, there will be a maximum of four on the courses. Private guiding is also available for groups or individuals. If you have three or more in a group we can offer a discount on the above prices. On the winter traverse of Liathach, Scotland, March 2015. Winter climbing and mountaineering is an adventurous activity and all clients will be exposed to an element of risk by taking part in this course. While we take all reasonable precautions to reduce risk it is neither possible nor desirable to completely eliminate these additional risks. Some of these hazards carry the risk of serious injury or death. It is important that you understand the risks involved before signing our booking form. We have identified the following areas as the principal additional risks of this itinerary. This is not a fully inclusive list - please ask if you would like to see our more detailed risk assessment for this course before booking. Remoteness : You will be several hours away from professional medical help for much of the time. In bad weather rescue and hospitalization could take many hours. Weather : Bad weather, including gale and storm force winds, freezing temperatures and blizzard conditions are extremely common in the Scottish mountains. Whilst forecasts are generally quite good these days and we will plan our course to avoid the most extreme weather, we cannot foresee all eventualities. Navigation : There is a small risk, in extreme weather, of becoming lost in the mountains. Mountaineering & Climbing Hazards : In many places you will be subjected to risks from rockfall and falling ice. There are risks of injury from even minor climbing falls and from slipping and sliding on snow and ice. There are risks as a result of mistakes in ropework and abseiling, including the possibility of human error. We cannot foresee every eventuality, nor control what other mountain users do. Avalanche : In the Scottish mountains in winter avalanches are common. Whilst we take all reasonable measures to avoid exposure to avalanche risk, we cannot foresee every eventuality, nor control what other mountain users do.